This is the audio archive website of “Our Life in Christ” Orthodox Radio Program. We invite you to join us, Steve Robinson (left) and Bill Gould (right), for an hour of discussion about the Orthodox Christian Church’s faith and practice. The program began as a live radio broadcast in 2001 on a Phoenix evangelical radio station. 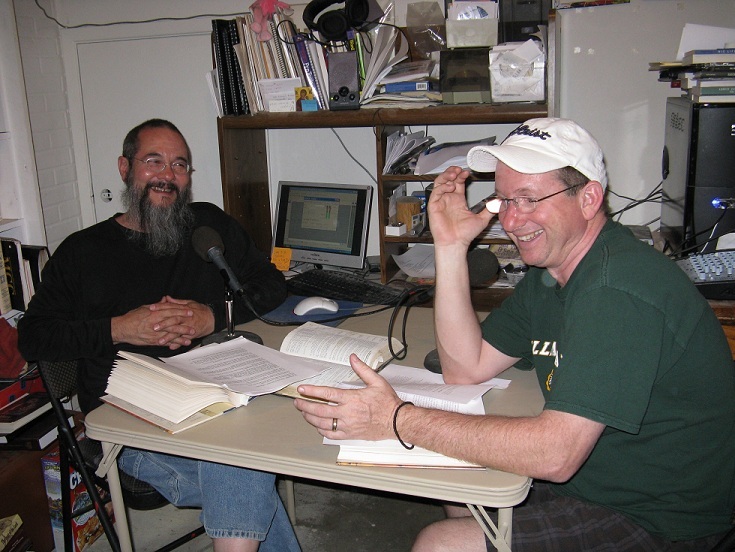 In 2005 we decided to to expand the program to the internet and began recording the program each week in Steve’s basement library/studio. For years the programs were distributed on our website and via Ancient Faith Radio. You can explore our website where the programs are categorized topically. The chronologically archived programs are still available on Ancient Faith Radio where they can be accessed and downloaded via iTunes. “Our Life In Christ” brings you the Orthodox Christian faith as recorded in Scripture, taught and practiced by the early Fathers of the Church, and preserved within the spiritual life of the Orthodox Christian Churches around the world. If you are tired of listening to us and want to hear other Orthodox podcasts take a look at the links below. Ancient Faith Radio has dozens of podcasts and a music station where you can listen to the hymns of the Orthodox services. Take a listen to “Steve the Builder”, Steve Robinson’s personal podcast that focuses on “regular people” living the Christian life in the world today.